I’ll score against Argentina tonight- Musa – Royal Times of Nigeria. 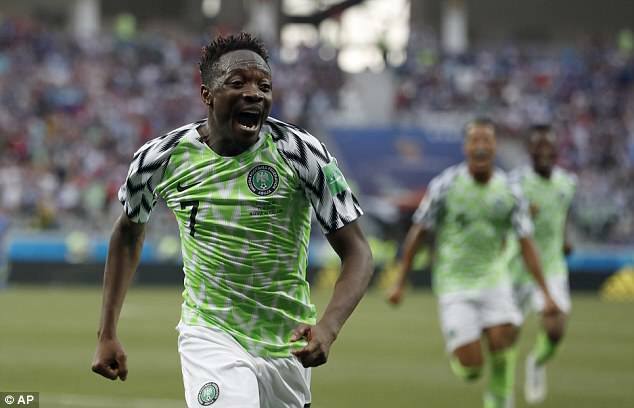 Ahmed Musa is basking in confidence after scoring two goals that gave Nigeria victory over Iceland and has promised to score again for Nigeria in tonight’s match against Argentina. Musa, 25, scored the two goals that gave Nigeria victory over Iceland in the Group D fixture of the ongoing FIFA World Cup in Russia. The Leicester City forward said that he has always scored against the Argentina national team and Lionel Messi, stating that he has a target to continue his scoring streak against the La Albiceleste today. He recounted how he scored two goals against Barcelona four years ago and also how he scored another two goals when he transferred to Leicester City. Citing these as reasons, he believes he can score two more goals tonight. The match will begin tonight at 7pm with Iceland and Croatia playing at the same time.